Recently I have been hearing rumblings about yet more bike lanes being retrofitted into Vancouver's West Side (Vancouver - Point Grey). For context, I am a former UCI World Cup Mountain Bike Professional athlete. I have represented Canada at the World Championships and believe I have probably cycled more kilometers than I drove a car for each of the last twenty years. I used to commute from Coquitlam to Yaletown daily using the Adanac/Union Street bike route. I LOVE cycling. I am not in favor of more bike lanes in Point Grey without sound evidence. Why? For starters, we have one of the best networks of bike lanes in the area already. 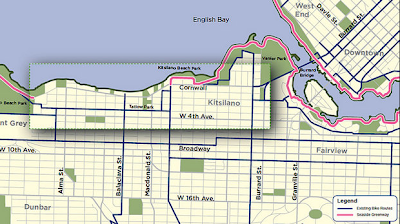 In fact, if you look at the map below, you will note that there are many established bike lanes. 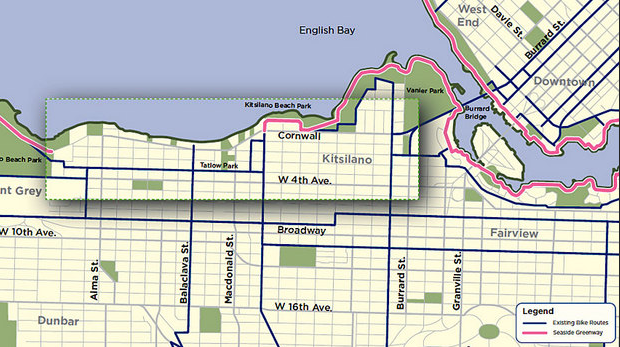 Keep in mind there are also paved paths within the park at Kits Beach and a secondary alternative route that can be used instead of Cornwall (shown in pink). The bike lanes have been retrofitted all over Vancouver and evidence suggests some of them may not be well thought out. I am generally in favor of the Burrard downtown lanes, the Richardson street lanes and along Pacific Avenue. The Hornby and Dunsmuir bike lanes I consider too dangerous as pedestrians and the two way nature of the traffic seem to be a step backwards in safety. 3. A fit and healthy population requires less demand on health care. Let me use the Burrard Street bridge to illustrate what needs to be considered. One must factor in the number of existing cyclists using a route already. For the sake of this argument, let's say that 1500 people per day crossed the Burrard Street bridge on bikes. Once you put in the new bike lanes, you must measure how many new people are riding. This should be averaged out over several years perhaps to account for seasonal changes. Now you have established a baseline and a new number. Again for sakes of argument, let's say that since the bike lanes go in, there are now 2,000 people using the bridge daily. The next step is to poll them to ask them how they were traveling before. Lets presume that all 500 of them drove cars an average of 15 kilometers per day. At an average speed of around 30 KPH, this means 7500 / 30 or about 250 car hours. That is a serious dent in pollution. Or so it seems. Now let's factor in the other side of the equation. According to Vancouver city archives, around 65,000 cars use the same bridge daily. City Hall has released some data suggesting that the bike lane fixtures have resulted in a 5 minute wait during rush hour in both directions. Since rush hour covers around 8:00 - 9:15 and 4:00 - 5:45 (roughly 3 hours a day, let's make an assumption that during this 3 hour period 15,000 cars are on the roads. Of course we should be given the real data to interpret. This assumption could be wrong so I would ask that the raw data be presented by Vancouver City hall. This would mean that you are now adding 15,000 cars for 1/12 an hour each belching more pollution back into the air. That is around 1250 car hours that are being used additionally each day. This results in a 5 fold increase in net pollution. I won't even get into the economic costs. Please do not use the numbers above as fact. They are not. They are fictional only to provide examples. Since none of this data has been released by City hall, we can only speculate what the numbers are. I want to see the real data (Andrea Reimer, David Eaves can you find?) so we can then have a discussion about it. The answer to satisfy both groups may be to bite the bullet and pay the full $60 million cost to properly retrofit bike lanes on the outboard side of the bridge. The cement is crumbling anyways and has to be replaced as many pillars are down to the rebar. What about safety? ICBC just released some data suggesting that car/bike accidents are up 500% at the north end of the bridge. Before you jump on that and say "hah! ", please remember that if there was a 800% increase in cyclists using the bridge, that number is actually a positive outcome. Of course if less than a 500% increase is happening, then we are losing to safety too. - Transportation Research Board, study based in Göteborg, Sweden. - Helsinki City Planning Department, Finland. - Odense Univ. Hospital, Denmark. What about extending the seawall? Unfortunately, that cannot happen without the Canadian Federal Government input as the shoreline is protected. This is not a municipal issue. In conclusion, I believe that our existing bike lanes are safe and effective. I personally have not seen any data that suggests we need or want more bike lanes on Point Grey road or Cornwall. I will grant that Point Grey road is harrowing to cycle down and I generally try to avoid it. If new bike lanes are going to be planned, let's have some reasonable scientific evidence to support their existence before we rush in and spend money. some great ideas here Duane - have you considered running in the upcoming BC election ? Ian, I am strongly considering it. I take a scientific approach to many problems and work with facts. I get scared of political parties like the NDP that pursue agenda's out of emotion. There are a lot more complex sides of almost every issue that first meet the eye. Our Premier is the incumbent in this riding and she doesn't even live here. This is my neighbourhood. I know the people, the issues and the challenges we face. If I do run, one thing I will promise is to really listen to idea from people everywhere.